The story of NewClub begins in 2005, at the home of golf in St. Andrews, Scotland. I was twenty years old, studying Commerce at University College Cork in Ireland. Admittedly more in love with golf courses than textbooks, I took an eight hour bus, a one hour boat, and a two hour train before arriving in St. Andrews. Before dropping my bags off on a friend's dorm room floor, I walked from the train station, down 'Golf Place' and laid eyes on the most beautiful site in golf, where it all began, The Old Course. 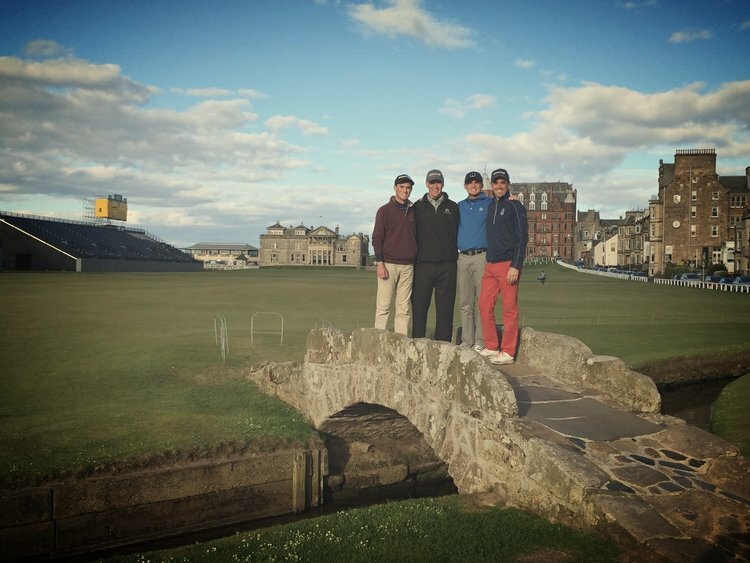 I spent that week playing all seven courses available at St. Andrews Links. Still the largest public golf complex in Europe. I could feel the history and tradition in every step. Land originally shaped by Old Tom Morris himself. It was enjoyable, it was memorable. It was spiritual, one of those child-like experiences that temporarily suspends your disbelief in magic. Fast forward 10 years to 2015, working for a tech company in Chicago, I made a return pilgrimage to the home of golf. After an especially memorable round on The Old Course, our group was invited as temporary members to have lunch at The New Golf Club of St. Andrews, one of the oldest golfing societies in the world, whose charter membership included Old Tom Morris, and whose clubhouse still sits alongside the 18th fairway of The Old Course. It was our experience there that sparked the idea of NewClub. We were warmly welcomed inside and given a tour of the clubhouse and it's heritage. While enjoying our lunch, we watched as The New Golf Club members file through the entrance, four golfers at a time to turn in scorecards, have a bite to eat, and reminisce about their match on one of the seven links courses available to them through the St. Andrews Trust. We met teachers, bankers, architects and grocers. Police officers, accountants, and fishermen. I was fascinated with how much of their town was represented. In addition to honorary members such as Arnold Palmer, Bobby Jones, and Sandy Herd, The New Golf Club of St. Andrews has been a place for hundreds of years where citizens of the town, any resident in good standing with a passion for the game can call their golfing home. When I returned to Chicago from that second pilgrimage in May of 2015, I decided it was time to start enjoying golf again, similar to the way I use to as a kid, similar to the way those members did at The New Golf Club of St. Andrews. Scotland is home to compelling, interesting, and memorable golf but some equally compelling golf courses were located in my midwestern backyard. I began a search, to find the private club that was best fit for me. There were plenty of options. Chicago is home to some of the best golf clubs in the country with rich history and passionate members. Even with so many great options, I was frustrated with the search. Endless networking, navigating club politics in every conversation, deciphering the commitment level of funds and time. It took me two full years before I felt comfortable in my golf club decision, and even then, I felt like I had lost valuable time, effort and dollars playing less enjoyable golf. The founders of this game, the shapers, the curators, the club makers, it was their intention that the game would always be accessible, sustainable, and memorable. A sport to be enjoyed by the everyman. Somewhere along the way, our courses became more about their prestige and less about their playability. Clubs became more about their exclusivity and less about their enjoyment, and being a member became more about your net worth and less about your love for the game of golf. The game does not discriminate, it gives us all something we can strive for, a greatness to chase, experiences to aspire. You don’t need to be a tour pro to experience the excitement and joy one finds on the golf course. It's why we've made it our mission at NewClub to enrich lives by connecting more passionate golfers with their most compelling golf.